One of the classic tests regarding self-awareness was developed in the 1970s by an American psychologist, and involves observing whether the subject (an animal, naturally) possesses the ability to see itself in a mirror and know at whom it looks: self-awareness allows for self-recognition. Whether it truly measures what it purports to is another matter entirely, and it obviously wouldn’t work on vampires, but it has a certain logical aura. Of course, what is reflected is not necessarily what we would see were we able to look at ourselves, but then, who sees the world if not through a lens? The place of Bacon’s enchanted glass is these days occupied by the smartphone, as no-one seems to dare boast of witnessing anything without having captured it on their tiny life-support machines: no evidence, no experience. But the smartphone, unlike the camera, lies through its teeth. Its tiny lens gives its images an unreal depth-of-field, and its colour palette is idiosyncratic to say the least – and that’s before we even begin to think about the many filters available with which we might rinse our image. And yet at an exhibition I attended yesterday, in which all the images were captured on the artist’s smartphone, everyone was talking about how the images were ‘what she saw’. I disagree. The images were more like the collection of a victorian naturalist. They were things she saw that she had shot, stuffed and exhibited for our pleasure. I don’t mean this in a pejorative sense, just that these images were not ‘real’, but created from the interaction of reality with the phone-wielding artist. In the image we see the artist. Perhaps the most influential thought experiment in the field of aesthetics is Plato’s allegory of the cave. In this, Plato asked what would happen if we were chained in a cave, staring at the back wall on which were cast the shadows of the world going about its business. Unable to perceive anything but what is on the wall, these shadows would form our understanding of the world. Imagine, he proposed, suddenly being released and being able to see the world as it actually is. It would scare us so much that we’d probably freak out and yearn for the days when the world was just a projection on the wall, at least in the first instance. Certainly our world-view would be challenged. Between Plato’s shadows and Instagram’s filters lies an approximation of reality. And so, back to self-awareness. When the world changes around us we anchor ourselves in our sense of self, but when we change, things become more complex. We look to the world and its reaction to us to convince ourselves that we are just that: ourselves. And so when we do something that changes us in the world’s eyes, this, too, is reflected back into our sense of self. We are awarded a PhD: we see, and are seen, differently. No longer did I hear the whisper ‘it’s a pity about Pete’ as I moved from being the relation no-one knew what to do with to the more acceptable black sheep with potential to become the latest eccentric. We hit the mark of fifty years of age: we see, and are seen, differently. We become a grandparent: good lord, we see, and are seen, differently. But in each case, we hold on to our self, because we’ve always been there. But there are some things that appear almost iconic, representative of our essence: to both us and the world. ‘When was the last time you had short hair?’ asked the girl at the hairdresser’s as she held my nine-inch plait in her hand, scissors at the ready. ‘Thirty-three years ago,’ I said. And so, an era ended. Yes, my ears are cold, my neck is cold, and I still do certain things as if I have long hair. The world definitely sees me differently now. But there was one thing I truly wasn’t expecting, and it happened as I walked around the gallery looking at pictures taken with a smartphone. 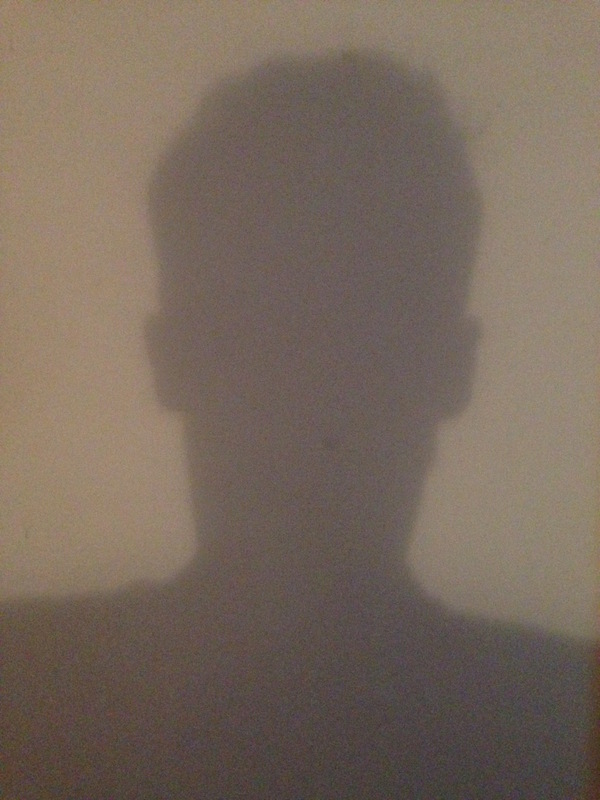 As I looked, my shadow fell onto the wall. This entry was posted in comment and tagged hair, hannah cork, iphone art, plato's cave by Pete Langman. Bookmark the permalink.